Now that OS X Yosemite is in open public beta and generating considerable interest from Mac users, a fair amount of complaints or frustrations have surfaced both in our comments and around the web on forums. Whether it’s a pestering bug, a beloved feature that has gone missing or that was tweaked in Yosemite, something that changed, the new font, the window restyling, transparencies, the loss of Dashboard, Dark Mode, or whatever else you want to offer feedback about, this is your chance. The entire point of the public beta of OS X Yosemite is to gather feedback from a variety of end users with regard to features and functionality. Apple is even making it simple to offer your perspective, report bugs, or suggest improvements, with the bundled Feedback Assistant app. 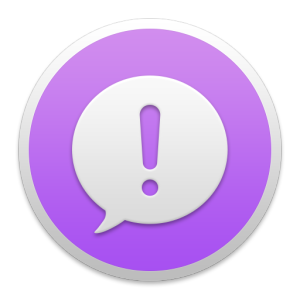 Having encountered a fair amount of novice users who installed Yosemite Beta, and who weren’t really aware of the ease in which you can send feedback directly to Apple with Feedback Assistant, we’re going to walk through it really quickly. Obviously advanced Mac users probably already know this, so this is really aimed at more casual OS X users who are running the OS X 10.10 Beta, but haven’t had much experience with beta testing or the Developer Preview builds before. Got a general issue, problem, or request for OS X? Here’s where you can offer feedback directly to Apple. Congratulations, you just sent feedback to Apple about the Yosemite beta. Easy, right? You can then use Feedback Assistant to keep track of the issues you submitted. 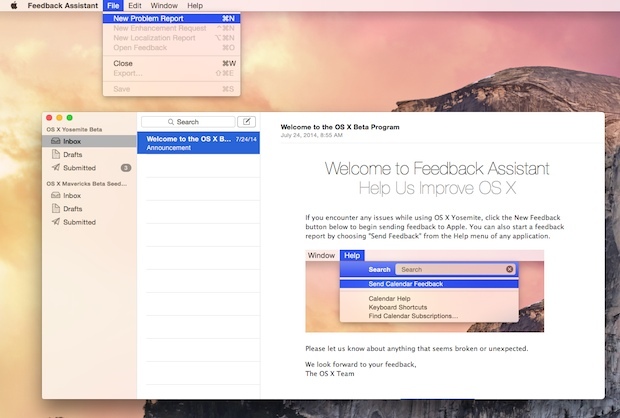 Just as easy as sending in general OS X feedback, except beginning the process from an application will immediately launch Feedback Assistant for you. 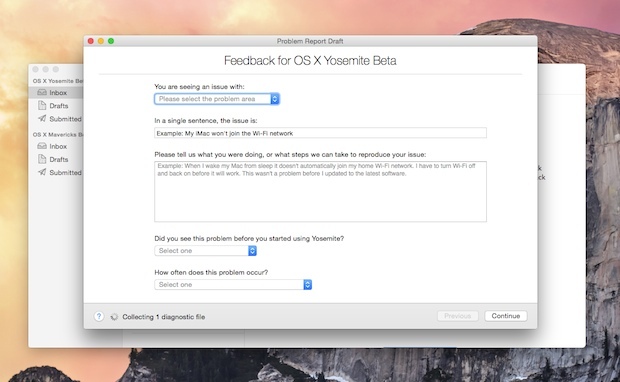 Remember, broader feedback is the entire point of Apple offering a public beta with Yosemite, so don’t be shy. If you find a bug, if you don’t like something, if you think something could be better, or if some app or feature is not behaving as anticipated, let Apple know with Feedback Assistant. It only takes a moment, and you just may shape the future of OS X! OK can we get a universal call to action, massive feedback, on the freaking !HORRIBLE FONT! in Yosemite? The font is so bad, it’s tiny and surely I’m not the only one it’s causing eye strain for and I have pretty good vision! Imagine someone with less than perfect eyesight using this thing… oh Jony Ive, Helvetica Neue is the worst. Bold that sucker, for the love of eyesight. And yes I sent a report about the font, did you? Please do. Nope. Your on your own there. It’s a softer, more rounded font, much easier on the eye. I hope they ignore you complaint. He is definitely not the only one not liking the new font. It looks very blurry and pixelated on non-retina displays. Shame. Everthying looks pixelated… not just the font. It’s horrible. The single user font since mavericks is so fn small I can’t barely read it, and for the life of me I cannot figure why it HAS to be so small, its not like I am going to program this dang thing-I just wanna run fsck -fy and then exit. Luckily, I already have that stuff memorized but to read any feedback the darn thing gives me I need a magnifying glass. It seems that most of the font complaints are from users without Retina displays, and most who have a Retina display don’t mind the font. Perhaps they just need an alternate font weight toggle for Macs with non-Retina screens? that to me is a good idea don’t want to go out and get a new iMac just because of a font issue. That or provide a way to change the font. I have a Retina display and I still think the new design is fuzzy. Maybe the real problem is that I’m over 30! If you are talking about the font that is used in the menu bar, it is more easily ready by enabling Dark Mode in the General System Preferences. Font and graphics. I feel like I’m using OS for 6 Year Olds. I happen to like the font, I have no issues reading anything on it and I use the beta as my daily driver. You are wasting your time using Feedback Assistant. The 2 developers Apple has left to work on OS x don’t care what you think. They are too engrossed in changing all the icons to something flat and boring. My dog could poo out better designs than the crap they are giving us in Yo. Wait until the successor to Yosemite comes out, we’ll lose the GUI altogether and be back to using the Command Line for everything. For the record, the font looks great on my 27″ non-Apple, non-Retina display. Apple really should close up and return the money to investors. Apple is about to be reminded why they don’t do public betas. I do t have an issue with the font – I like it on my 15″ MBP non retina. The icons look good but add zero functionality, bug wise other than the known issues I’ve sent 5 off for different issues.. But for a beta on a 4year old machine it’s running very smoothly. The beta runs great on my Early 2009 24” iMac. I don’t mind the fonts at all. In general I find the new UI refreshing. I’m happy to see the shiny glassy things go! There’s some nice new features in Yosemite. i would love the ability to revert to the 3D dock if the user wished then people could have the best of both worlds. running on a Early 2009 24” iMac. I agree on the dock….with the graphics we have today why flat???? How can we revert to the 3D dock? I agree. The flat icons are cold and off-putting, as are the new cold icon colors. I’m confused. This is the second time I’ve heard something about no Dashboard in Yosemite. I still have it. Widgets are now included in the Notification Center, the assumption is that Dashboard itself will be kaput in the process. My Wi-Fi has stopped working. Can’t do much without Internet. How did you make this reply without the internet? Mine too, Keefe. But I got a man in and he sorted it out. In fact Yosemite is a **** nightmare, I lost photo albums/programmes( they never warned us) & my mac is running so slow it is driving me nuts. I don`t like the flat design, I`d prefer the 3D design of the windows and dock. I like more the color of the old folder-icons than the new ones. Hope that Apple will give an opportunity to change them. Then all users can switch to 10.10. What a crap this Yosemite really is. Brings a ton of bugs. It’s a shame, OSX’s GUI only gets worse after each update. People, do not install it during Beta. I hate the new look of Yosemite. I miss the old mac look like in Mavericks. Apple you need to either bring back the look of Mavericks or make an option to make it look like it again. i like the advancements it has but don’t like the new GUI. Bring back the 3D dock! Yes…. Same here! 2D icons looks so old school. We need the option to change it back to 3D. Yes i hate the look of it too , they need to bring back the 3d dock , are they trying to look just like another Microsoft program because if they are they have done a really good job, and if we wanted that we would not have brought Apple in the first place …. I will miss the old mac design , with 3d dock and icons :(. this one is like a toy. I do not like the flart dock. It sticks out like a sore thumb when I change dsktops. It is like going back ten years. Linux has a 2D/3D option. Cannot Apple do the same? Where the 3D dock ? The new yosemite dock is awfull, is poor graphics and is 2D. I don’t like, very ugly, bad designed ! Anyone knows a way to go back the old 3D dock ? if possible ! Im thinking to go back to Lion because lion have the best high resolution designed dock. And the old safari browser of Lion you can navigate on history using images much better better than the new safari browser, and safari tabs agroup is better on lion too. I’m really disappointed with the new 2D icons in Yosemite.. Please bring the 3D icons back..
All my friends think the same thing. Apple is very good company making very good, quality products. i was excited to install Yosemite OS but after installing it got completely disappointed with it. the Dock is very very ordinary. New one is just simple 2d. Desktop screen is very bad. This is first look lets see what more surprises are there inside. What I don’t like about these constant OS updates is that they keep making tech that works perfectly well redundant, very un eco, both ecological and economically speaking. These companies need to start thinking more about society and our environment, globalisation and these giant moraless corporations are are blight on humanity! and yet they are created and run by humanity, how can anyone be happy knowing that the million or billions they are weasling away, through corprate mal practice and lack of ethics or empathy could improve and change so many lives. We as consumers need to make the change, because these corporates will push and push until we have nothing left. Why this yosemite keep on loading whenever I turn on my iMac? Wasting alot of times where the previous OS was never like this…:( DISAPPOINTED costumer…. I just upgraded my operating system to your Yoshimite. It’s absolutely disgusting. It looks like a cheap copy. The contrast is horrific and everything such as it’s behaviour is poor. I’ve been working on my business for 4 years using Mac, and because I deal with graphics, your Yoshimite Operating system had caused a serious effect on my business as your icons and general quality of colour and contrast is so bad it effects the way I am able to previewer my original files through your cheap looking pixilated operating system. Hopefully it is a mistake down my side during Installation of your new operating system of Yoshimite. I will go down to the shop tomorrow. If by any means this effect on my business had been effected buy your new operating system, then I will be pressing for very serious charges against apple macintosh. The worst OS X I have ever used. It has become more complicated and time consuming. Please don’t upgrade if you are running mavericks. Worst OS update ever. Difficult to read font, cluncky icons. This update does not look like Mac – it looks like a PC. Terrible. yes an awful update- the visual appearance is flat, murky and unsophisticated. I hope this update can be undone!?! Whoever approved the design of this interface had no idea why creative people use a mac. This is worse than my cheap old ugly 200 $ pc. I”m very very disappointed with apple. This new look interface they have bought out, where everything is very flat and montone is just boring. I loved when iTunes had the juke box way of flicking through album covers. Now I hardly bother with iTunes as I find it no where near as easy to navigate. APPLE.. you need to go back to the 3D, drop shadow style of interface.. looked much more high tech and ahead of the pack. Now Apple products have a ‘we paid some students a few bucks to create the new interface over a weekend’. FIX it and go back to the fantastic user interface of 3 to 4 years ago. I bought a MacBook Pro early last year to manage my iPhone 4 which has seen heavy use. Had major problems with the Mac so had to ditch Mavericks and upgrade to Yosemite during a fix- wish I hadn’t bothered; the user interface looks so bad I actually thought it hadn’t loaded properly at first! Bought an iPhone 6 to replace the 4, looks just as bad (if not worse) both systems are bland and difficult to navigate. I just don’t get it- thought Apple’s stuff ‘just worked’ -Apple, do the world a favour and just stick to trying to make it better rather than changing it? are gross. I hate, hate, hate it. What is wrong with APPLE? Did you fire all the designers or give them lobotomies? This is a Complaint against OS X Yosemite in general. I downloaded it on my 2012 MB Air, ended up crashing beyond repair. I bought a new MB Pro about a month ago with Mavericks on it, I like it but thought I would “Try” Yosemite on the 2014 MBPro I bought in February 2015. Immediately started having problems again. Specifically Memory would “Run Out”! After a online chat and a call to one of Apples call centers, the problem persisted and they could not resolve it and I had to put my Mavericks backup back on the machine. I have to say Apple needs to quit promoting the Yosemite software until it has the bugs worked out of it or at least warn people of the possibilities of “Computer Destruction” if the software is downloaded as is what happened to my MB Air. I got it off my new computer before any permanent damage and though I like Yosemite’s Interface, Its very unstable. Specific Problems: Eats up Memory (Ram), Locks up, I lost a lot of documents mysteriously on my MB Air, Installed a real time memory clean app and it helps, but doesn’t address long term problems. Something happened On my MB Air that caused complete failure. I also noticed Yosemite likes to “Duplicate” file sets without any help? I would recommend anyone thinking about downloading Yosemite to think twice before they do it! My Opinion. Yoshemite is now going the way of Windows Vista: adding all sorts of fanciness but losing basic functionality. It now takes ages to start your computer, until very recently the “recent documents” list was a real mess (basically, showing only jpeg and pdf files), and a lot of internet connectivity issues. It was Windows Vista’s poor usability record that made me switch to Apple; it may well be Yosemite that will make me switch to something else. WTH? I upgraded my Mac to Yosmite 10.10.4. What a mistake, Iphoto gone with some cheezy photo program. Computer slowed down with the spinning wheel, Itunes just seems to be getting worse and worse. About had it with this. Need better software engineers apple, send them back to school. I’m so bummed. Just bought a new Macbook air with OSX 10.10.3. I reminds me of the old MSDOS. It requires dozens of memorized keystrokes to navigate, none of which are mentioned in the useless HELP menu. I’ve spent more time on the phone with Apple support than I have on the new laptop. This is my 14th Mac computer, and I’ve never had to bother Apple support before. My previous Macs were all intuitive and easy to use. This OS refuses to adapt to my workstyle. It seems more PC than windows, and slower. i down loaded yosemite and over 5000 of my iPhotos are gone! really? if they are on the comp still why did they not reload? ?? Yosemite is the hugest misteke made by Apple. Shame on you! I am going to delete it right now and never come back. Million times a day internet discontencts. I am not able to work! So awful! Really tired and sick of it! If something is not ready dont sell it on the market!!!!!!!!!!!!!!!!!!!!!!!!! !